Have you ever changed your diet based on headlines only to find yourself changing back a year later? Headlines about diet and health can be very disconcerting when they challenge long-held beliefs. A recent example is the headline "Fish is not a proven heart protector." A natural response is confusion, frustration and wondering if you should even bother to eat well. Question: How can the average person put this type of news into perspective? Answer: Studies about the potential protective effects of fish or fish oils in preventing various diseases evaluate groups of people to determine how the average person in the group is affected. You may or may not be like the "average" person in the study. This is one reason why the conclusion of one study sometimes differs with the conclusion of another study. Each one can have a different "average" person and generally these studies have not been conducted on older people. Q: So, what can you do with conflicting information? A: Focus on function. If the headline seems to imply that eating fish provides no benefits for a particular disease, such as heart disease or cancer, do not jump to the conclusion that fish has no health benefits. Fish is a high-quality protein with relatively low fat. As people get older, protein needs don't decline, but calorie needs drop. Consuming an adequate amount of high-quality protein can become more challenging with age and foods like fish can be a very beneficial source, especially for those with chewing problems. Most of the media hype about the omega-3 fatty acids in fish centers on their potential for preventing chronic conditions, especially cardiovascular disease. But these special fatty acids also have other important functions. One fish oil omega-3 fatty acid is called eicosapentaenoic acid, or EPA, which is converted by cells into compounds known to reduce inflammation and help dilate blood vessels. Another omega-3 fatty acid is docosahexaenoic acid, or DHA, a major component of brain tissue and of the retina in the eye. Together, EPA and DHA are known to help reduce elevated blood triglycerides and boost the "good" HDL cholesterol level. For some people, an adequate supply of these fatty acids can normalize blood lipid levels better than medication. 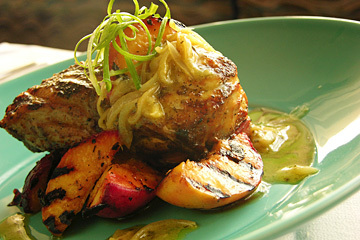 Grilled halibut and peaches with shallot-mustard vinaigrette, garnished with julienned green onions. Q: Do contaminants in fish pose a significant risk? A: Some types of wild fish from specific locations can contain ciguatoxin and puffer fish contain the powerful tetrodotoxin. But generally, major concerns about more common fish center on the potential for contamination with mercury and PCBs. When scientists evaluate the risk/benefit balance between these contaminants and the known beneficial components of fish, the general conclusion is that most adults can safely consume from 7 to 15 ounces of fish per week without concern. Fortunately, this also is the amount of fish known to provide enough omega-3 fatty acids to provide measurable health benefits. Q: Are fish oil supplements contaminated? A: ConsumerLab.com tested 41 fish oil supplements and found that none contained significant amounts of mercury or PCBs. Three products failed testing because two contained less of the fatty acids than claimed on the label and one product contained oil that was not fresh. Q: Can taking fish oil supplements pose any other risks? So as you watch the roller coaster of health headlines go by, it is far better to watch than to get on the ride. Rest assured that a key to health is consuming a wide variety of wholesome foods in moderate amounts and balanced proportions. To maximize your odds of good health, add some daily physical activity and do not stress out on headlines or anything else. Alan Titchenal, Ph.D., C.N.S. and Joannie Dobbs, Ph.D., C.N.S. are nutritionists in the Department of Human Nutrition, Food and Animal Sciences, College of Tropical Agriculture and Human Resources, University of Hawaii-Manoa. Dr. Dobbs also works with University Health Services.